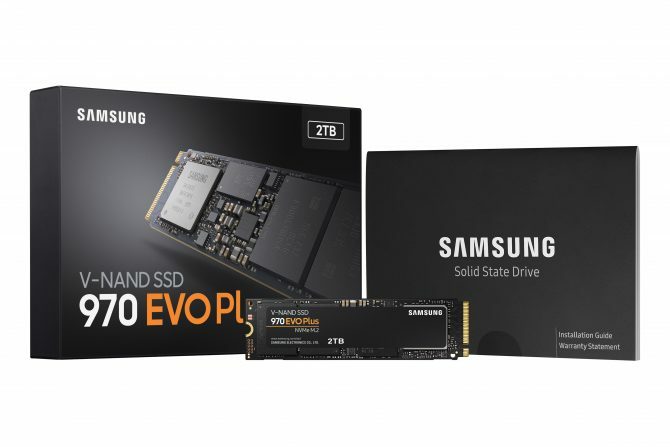 Samsung yesterday launched the Samsung 970 EVO Plus series NVMe SSDs. The 970 EVO Plus series is the successor to the 970 EVO series and many of the specifications are similar. Just like the 970 EVO, also the 970 EVO Plus drives are available in capacities of 250 GB, 500 GB, 1 TB and 2 TB. The biggest difference between both series is the used 3D NAND memory, or V-NAND as Samsung likes to call it. Both series use MLC 3D-NAND, but the 970 EVO uses Samsung’s 64-layer V-NAND. In the 970 EVO Plus, the Korean chip giant uses its fifth generation 9x-layer V-NAND. Both series use the same Phoenix controller. The new 3D-NAND has its effects on performance. According to Samsung’s specifications, the new drive delivers sequential read and write speeds of up to 3,500 MB/s and up to 3,300 MB/s, respectively, while random speeds come in at up to 620,000 IOPS for read and up to 560,000 IOPS for write operations. That means the 970 EVO Plus offers similar sequential read speeds as the 970 EVO, but that it outperforms its predecessor in sequential writes and random performance. The 970 EVO Plus comes in an M.2 form factor using the PCIe Gen3 x4 interface. Samsung provides a five-year limited warranty or up to 1,200 terabytes written. The 250 GB, 500 GB and 1 TB capacity versions are now available for purchase worldwide, the 2 TB capacity will become available in April. Manufacturer’s suggested retail prices start at $89.99.